TUAW receives a lot of app submissions for review, both for Mac and iPhone. But it's unusual when a developer sends us individual press releases for a relatively large number of apps. Steven Degutis is the brain behind a company called Thoughtful Tree. In his words, "I'm an indie Mac developer who writes apps that make my job easier and smoother, and then if I think they're useful enough, I share them with everyone via my company Thoughtful Tree Software. That's just how I roll." The first application that caught my attention was one called Docks (US$10), which takes snapshots of what icons are in your Mac OS X Dock, and then lets you swap out Docks depending on what kind of work you're currently doing (see screenshot below). Need a writing Dock? Put Word, Storyist, and WriteRoom in a special Dock. Doing a lot of photo work? Create a Dock with PhotoShop, Aperture, and any other special tools you like to use. The new Docks 2.0 is now integrated with Spaces, so retrieving a specific Space sets up a custom Dock as well. Another application that makes sense for a Desktop slob like me is the aptly-named DeskLabels (US$10). If you tend to save a lot of documents on your Mac desktop, whether by choice or unintentionally, you'll often find that things get out of control very quickly. DeskLabels allows you to create labels for your desktop (see below) to organize groups of icons without creating yet another set of folders. Degutis has also created a Mac app that is perfect for those of us who need to take screenshots on a regular basis. As you probably know, when you take screenshots using the Command-Shift-4 key combination, Mac OS X throws a nice shadow around the windows to give your screenshot a 3-D look. However, when you're popping those screenshots into a TUAW post, the 3-D shadows are not exactly what you want to see. Fortunately, the free ShadowControl Mac app deletes those pesky shadows for you. Next on the list of Thoughtful Tree Mac apps is TunesBar (US$5.00). Want to know what's playing in iTunes without having to flip to the application? TunesBar displays the song name and artist in the menu bar (see screenshot below), and a quick click on that information will let you control iTunes playback of your music library. 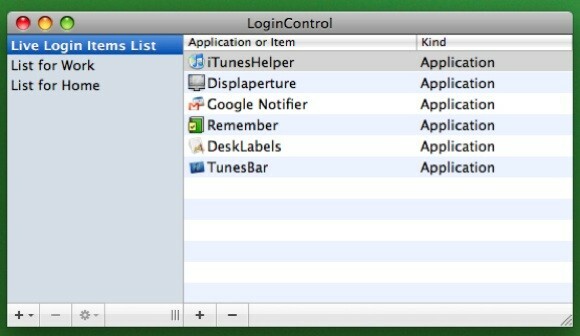 Have you ever wanted a bit more control over those Login Items that are listed in System Preferences under Accounts? The next little gem from Thoughtful Tree is LoginControl (US$10.00), which lets you set different Login Items based on location (for example, home or work), or other personal preferences. See the screenshot below for more more details. Last, but certainly not the least important, is Modena (US$5.00). 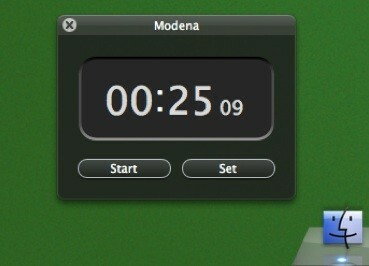 This application is a simple and effective timer for your Mac. The timer can appear as just a tiny little floating heads-up display, numbers counting down in your menu bar, or take over your Mac screen with large, bold numbers floating on a black background. You can either set the time as relative (count down two hours, for instance) or absolute (count down to 5 PM). 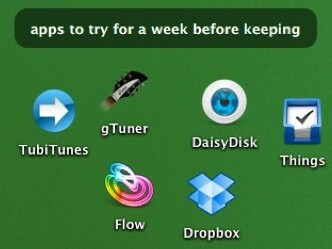 I hope you enjoyed this six-pack of Mac apps. All of the Thoughtful Tree Software applications listed here can be downloaded for a free 30-day trial before you decide whether or not you want to buy.